I love new years, and I really enjoy making New Year’s resolutions – I love the feeling of a blank canvas to fill with more love, more success, and more happiness. And I don’t mean to brag, but I’m actually quite good at sticking to them. 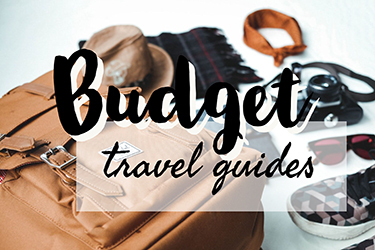 As well as backpack from Bali to London, get my YouTube channel sorted and write a book, one of my new year’s resolutions this year was to find a travelling balance. Two years ago, I was the ultimate backpacker – I used to stay in the cheapest hostel rooms possible (like the infamous Chungking Mansions in Hong Kong), only eat street food, and do ridiculous things like sleep in airports to save money. Over the last year, I’ve completely changed. I only stayed in a hostel three times in 2018, I stayed in quite a few 4-star hotels and as my dietary preferences have changed I’m not eating as much street food. With my job, I can’t do the non-stop backpacking life anymore. Sometimes I need my own space to get work done, and hostels can be a fantastic distraction. 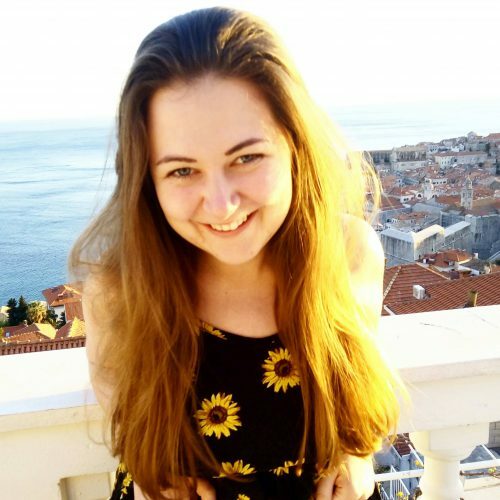 But I still want to travel on a budget, meet new people and enjoy the hostel atmosphere – my travels in 2018 could be a little unsocial at times! So, I challenged myself to strike a balance in 2019. After a lovely 2 weeks celebrating Christmas in Koh Lanta and Bangkok with my mum and sister, the time seemed nigh to get back into the hostel life. So I headed to Cambodia and Mad Monkey Siem Reap. 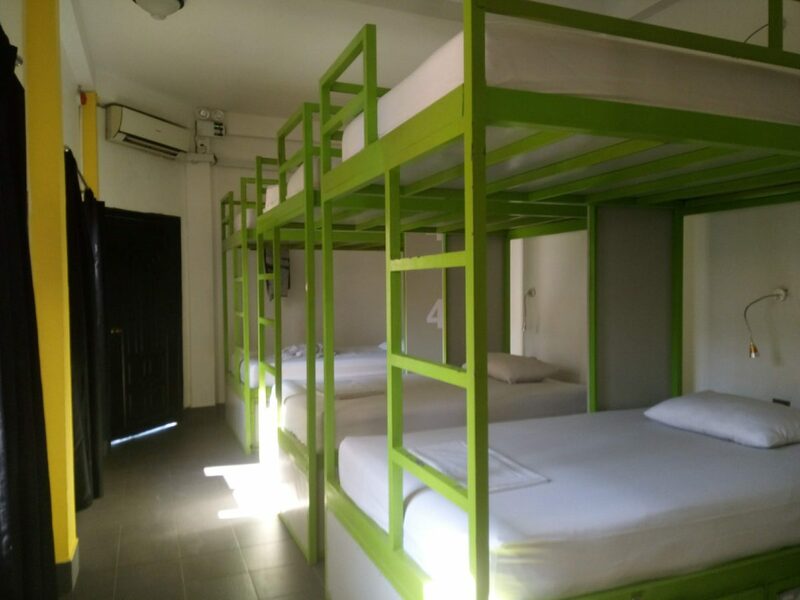 Mad Monkeys is a group of hostels located in Thailand, Cambodia, the Phillippines and Australia. They offer hostels with a social atmosphere, lots of events and activities, chill out areas and bars and restaurants. Each country that they operate in has its own head office, but they work with the same values and have an extensive social programme to give back to the communities in which they operate. 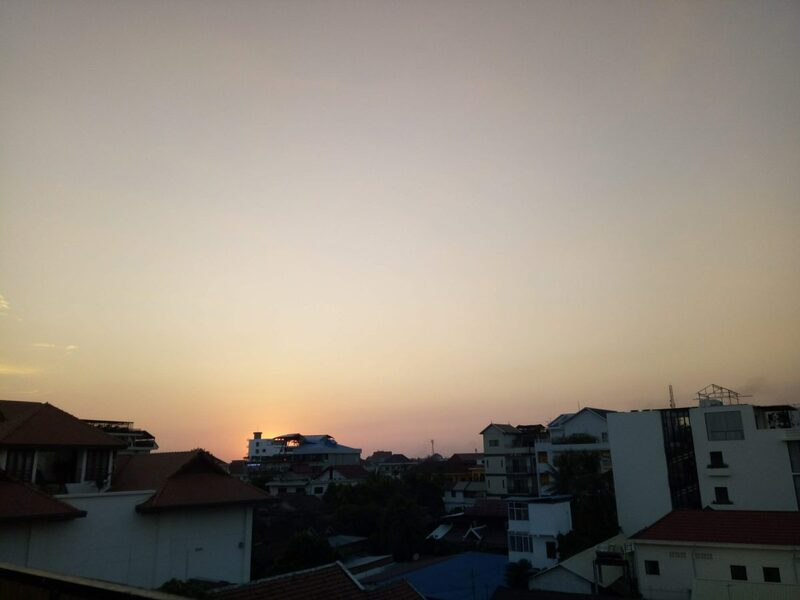 I arrived in Siem Reap as it was getting dark on the 5th of January. Although I checked into the hostel mid-way through a pool party, everyone (staff and guests) was friendly and welcoming. I was shown to my four-bed dorm room, which had oversize single beds, each in their own little cubbyhole with individual lights and plug sockets. Each bed had its own large locker – big enough to store bags – but there was also room on the floor for big backpacks. Each dorm at Mad Monkey has an en-suite. The bathrooms were fine, as is usual in Asia the shower was not separate, but this is pretty standard! Hot water was always available when I needed it. I moved dorms after my second night because I decided I would rather stay with a better mix of people, which saw me moving to the 12 bed dorm. It was probably the best 12 bed dorm that I’ve ever stayed in – some hostels would turn a room this size into a 20 bed, but Mad Monkeys favours giving people enough space to actually be able to move and store their belongings, which is always nice! Again, each bed has a light and plug, and there are 4 showers/ toilets at the end of the room, with a large getting ready area. The spaciousness of this dorm meant that even if people were getting ready at the other end, my sleep wasn’t affected. I actually found it easier to sleep in this dorm, due to the fact that as there were so many people those coming in late at night knew to be quiet as there would undoubtedly be people already asleep. All Mad Monkey hostels have an attached bar and restaurant. I was really pleased with the number of vegetarian options on the menu, most of which could be veganised. While travelling as a vegan isn’t too hard in South East Asia, it’s always nice to be able to have some Western food (hello avocado on toast and veggie burgers!) if I need a break from noodles and curries. I ended up eating at the Mad Monkey’s Café for two breakfasts, one lunch, and one dinner. Each meal was really tasty and there were 3-4 more things on the menu I could have tried (if you’re vegan, you’ll know how much of a cause for celebration this is!). I did, however, spend a lot of time hanging out at the rooftop bar, taking advantage of their $1 beer and 3 for 2 cocktail offers (there were different offers nightly, and free shots most nights too!). I got chatting to people from all over the world, from Peru to India, played card games and enjoyed the music. It was a great time. I’ll also point out that while Mad Monkey is a lively hostel, and there definitely is an emphasis on partying, it’s not in your face. 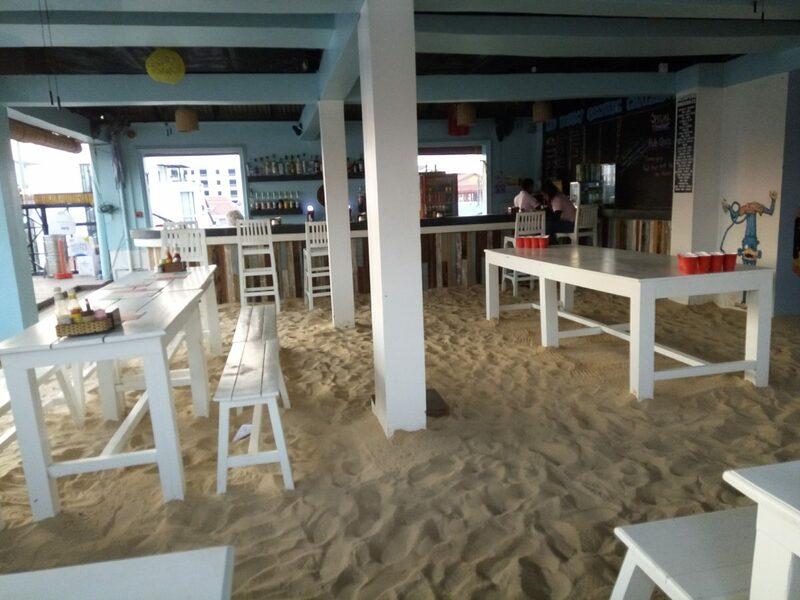 I’ve been to hostels which are really pushy with drinking and playing drinking games, and Mad Monkey isn’t like that at all – if you want to use the bar to just have a couple of drinks, it’s completely up to you. This was one of the great things about the hostel for me! If you know me, you’ll know that while I love meeting new people, I also really appreciate a good night’s sleep and will happily sacrifice a party if I need some shut-eye. I was a bit worried about this as I knew that Mad Monkey was a party hostel, but they are very conscious that some people don’t want to stay out all night. The bar closes at midnight and people are ushered out from that area and around the pool. The bar is also on its own floor, meaning that music coming downstairs is minimal. There is no guarantee, of course, that people won’t be rowdy, but night security are always on guard to tell people to be quiet. 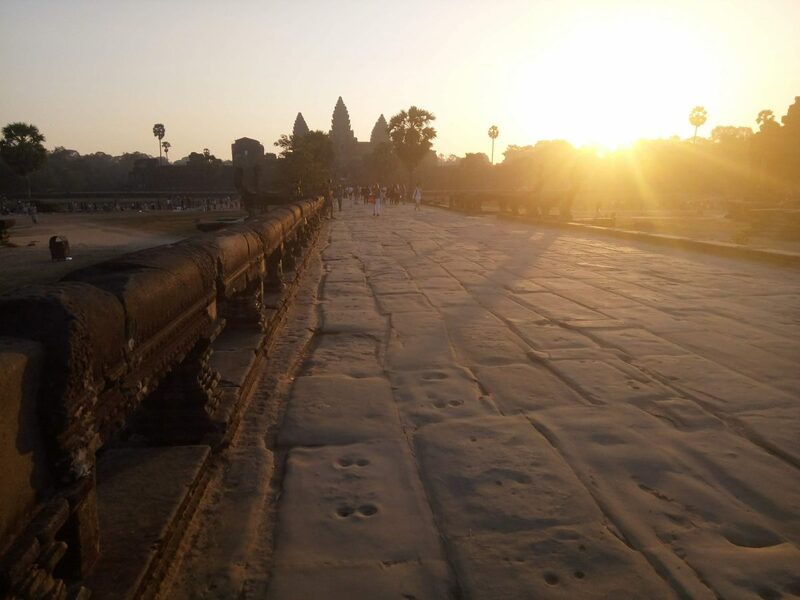 It is very clear that while the bar is the place to be until 12, the hostel is not somewhere for all night parties which is really good (especially for those waking up at 4:30 am for Angkor Wat sunrise – pictured above!). The staff here were just lovely. They all spoke great English, always had a smile on their face and would do anything to help. The front desk helped me with numerous inquiries: from whether I could get a Laos visa on arrival at the Stung Treng border (if you need to know, you can, I’ve now done it), to booking my transport, to helping me move rooms. The bar and restaurant staff were helpful with my dietary requirements and were always up for a chat. The wifi was excellent! Good enough for me to make WhatsApp calls and track time on a job I was doing. Way over the usual standard for hostel wifi, 10/10. Now, as you know, I’m not all party hostels and I don’t stay in them everywhere I go. While they’re fun sometimes, I do find that a lot of them can be very disconnected to the country that they’re in. This is where Mad Monkeys stands apart from the rest and made it a company that I wanted to work with. 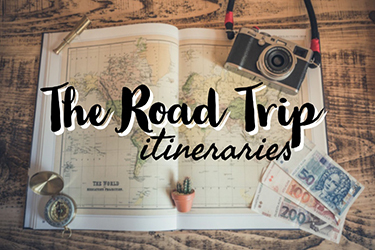 They do a lot more than provide a place for backpackers to party in the countries that they are present in – they actually give back to the community. As you’ve all heard me say time and time again, it is so important that we as travelers do this – we can’t just go to countries, especially developing ones like Cambodia, and not give back. Tourism can help these countries, but only if it’s done in the right way. And supporting businesses who are giving back is a great way to do this. 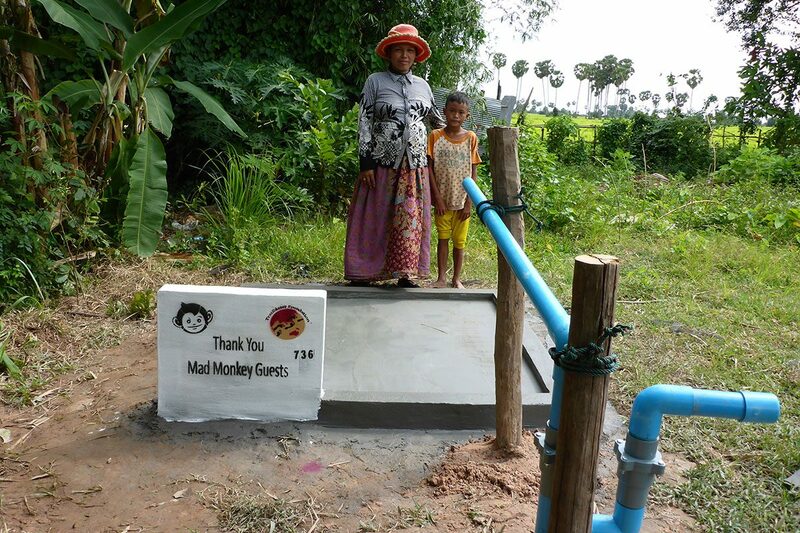 They run a clean water project to build water wells and filters in rural Cambodia – where 50-60% of citizens do not have clean water. They run an education fund that deals with reasons why some children in South East Asian communities don’t get an education and works out solutions for this. They pay all of their staff a competitive wage, way over the country’s minimum, and provide benefits and they offer English lessons and other useful training that will help staff members in all aspects of their life. They have a creative hub programme which gives opportunities for artists around the globe. There is lots of information about their programmes and initiatives dotted around the hostel, which is fantastic as it reminds travellers to be responsible tourists. 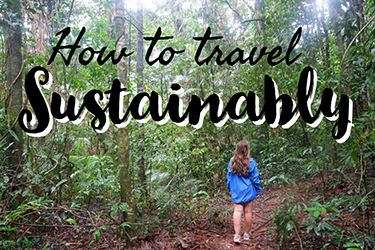 You don’t have to stop travelling to be sustainable, you just have to support the right companies, and it was really refreshing to see a backpacker hostel take such initiative and support the countries in which it bases itself. Paying for your stay at Mad Monkey supports their projects; and you can support them even more by purchasing food and drink from the restaurant and bar. So yes, that means that your $1 beer is making a difference! You know I’ll always be totally real with ya, so do I have any complaints about Mad Monkeys? My only minor issue was that the bathroom light could sometimes be a bit disruptive in the 12-bed dorm. Do bear in mind that I was sleeping right by the bathroom and am a contender for Britain’s lightest sleeper, so this probably wouldn’t bother normal people, but I thought I’d mention it just to keep it real. This wasn’t a problem in the 4-bed dorm, and other than that, the dorms were excellent. This isn’t really a complaint, and I am mainly saying this because I am the plastic police, but as Mad Monkeys prides itself on its social sustainability, it would be great to see this expand into environmental sustainability with offering reusable straws at the bar. I can’t say that I’ve seen this in any other hostels in South East Asia, but it would be another thing that would help Mad Monkeys stand out from the rest! Apart from that, everything was really great. Tasty food, great people, a fun atmosphere – what’s not to love?! Angkor Wat – of course! It can be done in a day, although you’d be pretty rushed and very tired (Angkor Wat by sunrise is an absolute must). If you buy a 3 day pass, you’ll be able to see the temples at a more leisurely pace, not exhaust yourself and make it out to some temples a bit further out (which were my favourite ones). The hostel desk can organise a tuk-tuk or car to take you around. Angkor National Museum – if you want a deeper understanding of Angkor Wat, check out the museum which will detail the entire ancient civilisation to you and really make the ruins come to life. Angkor Night Market – a market dedicated to preserving Khmer crafts, this is the place to go to purchase some authentic local souvenirs in Siem Reap! Tonle Sap – this is South East Asia’s largest freshwater lake, and is a must-do while you’re in Siem Reap. Visiting the floating market is a great way to see it. The Landmine Museum – this spot will tell you a little more about the sad parts of Cambodia’s history and its war-torn past. Profits go towards landmine clearing and to help landmine victims. The Cambodian Circus (no animals) – this circus is dedicated solely to human acrobatics and the displays are absolutely breathtaking. It makes for a great traditional night’s entertainment in Siem Reap! Pub Street – the infamous pub street is a must-do for many visitors to Siem Reap – although I personally didn’t love it. I’d recommend at least 4 nights in Siem Reap to see what the place has to offer. Mad Monkeys has a really great mix of being fun and lively but not too in your face, due to their bar closing hours and quiet time. 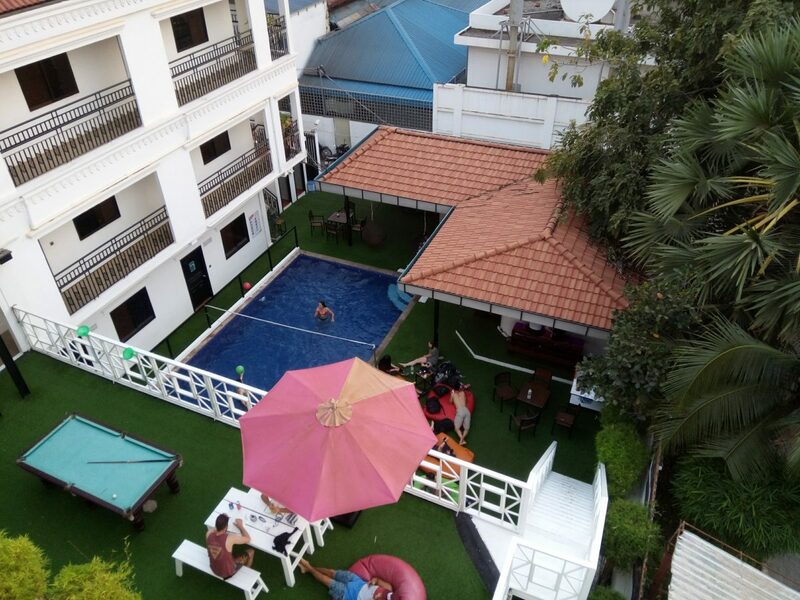 They have all the facilities you need for a comfortable stay – WiFi, a pool, laundry, tour and bus bookings – and encourage people to not only enjoy being around other backpackers but see Siem Reap and Angkor Wat as much as possible as well. And their social development programme is just wonderful, really making them stand out from other hostels in South East Asia. 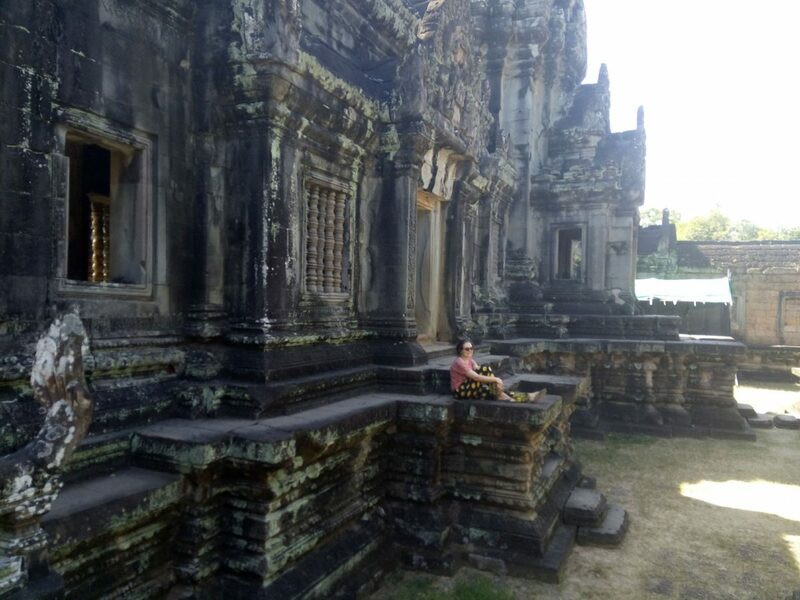 They’re a fantastic choice for backpackers who don’t mind a bit of a party and want to meet people but who also want to enjoy Siem Reap and give back to the community. Disclaimer: My stay at Mad Monkeys Siem Reap was sponsored by the hostel. All opinions remain my own.